Can Grigor Turn Tables On Rafa? 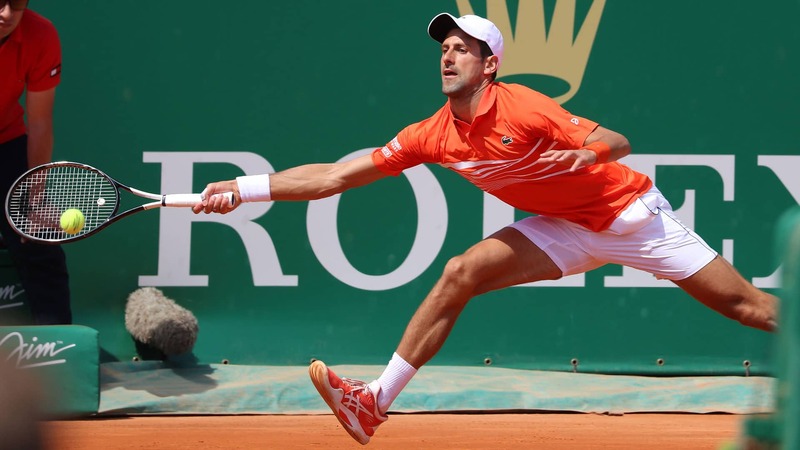 Watch Novak Djokovic carve a perfect drop shot against Taylor Fritz in the third round of the Rolex Monte-Carlo Masters. Photo Credit: AFP/Getty Images. Watch live tennis streams at http://www.tennistv.com. Watch the biggest moments from the 2013 Rolex Monte-Carlo Masters battle between Rafael Nadal and Grigor Dimitrov. Watch live tennis streams at http://www.tennistv.com. Watch Marco Cecchinato win the second set of his match against Guido Pella in style at the Rolex Monte-Carlo Masters. Photo Credit: Clive Brunskill/Getty Images. Watch live tennis streams at http://www.tennistv.com. Watch Daniil Medvedev reflect on his win against Stefanos Tsitsipas at the Rolex Monte-Carlo Masters and explain why his game has been improving so quickly. Watch live tennis streams at http://www.tennistv.com. Watch highlights as Rafael Nadal, Alexander Zverev and Dominic Thiem all prevail on Wednesday at the Rolex Monte-Carlo Masters. Photo: Clive Brunskill/Getty Images. Watch live tennis streams at http://www.tennistv.com. Watch as Rafael Nadal shows off his quick instincts, pouncing on a volley winner in the second round of the Rolex Monte-Carlo Masters. Photo: Clive Brunskill/Getty Images. Watch live tennis streams at http://www.tennistv.com. Watch as Grigor Dimitrov produces a moment of magic at the Rolex Monte-Carlo Masters, lunging for a brilliant drop volley, en route to a second-round win over Jan-Lennard Struff. Watch as Jamie Murray and Bruno Soares hit a fabulous winner to move into the quarter-finals at the Rolex Monte-Carlo Masters. Photo: Realis/Rolex Monte-Carlo Masters. Watch live tennis streams at http://www.tennistv.com. Watch as Rafael Nadal discusses his convincing 6-1, 6-1 win over Roberto Bautista Agut to kick off his Rolex Monte-Carlo Masters campaign. Watch live tennis streams at http://www.tennistv.com. Look back on the moment when 11-time champion Rafael Nadal secured his first match win at the Rolex Monte-Carlo Masters, defeating Karol Kucera in 2003. Watch live tennis streams at http://www.tennistv.com. Watch as Pierre-Hugues Herbert shows off his agility, racing to make the perfect pass against Kei Nishikori at the Rolex Monte-Carlo Masters. Photo: Clive Brunskill/Getty Images. Watch live tennis streams at http://www.tennistv.com. Watch as Stefanos Tsitsipas changes direction mid-rally, blasting a backhand winner against Mikhail Kukushkin at the Rolex Monte-Carlo Masters. Photo: Clive Brunskill/Getty Images. Watch live tennis streams at http://www.tennistv.com. Watch as an aggressive Pierre-Hugues Herbert paints the lines, en route to a second-round upset of 2018 finalist Kei Nishikori at the Rolex Monte-Carlo Masters. Photo: Clive Brunskill/Getty Images. Watch live tennis streams at http://www.tennistv.com. Relive the moment Rafael Nadal clinches his first Rolex Monte-Carlo Masters title - and first at an ATP Masters 1000 - with victory over Guillermo Coria in 2005. Watch live tennis streams at http://www.tennistv.com. Alexander Zverev reflects on his win over Felix Auger-Aliassime to start off his 2019 Rolex Monte-Carlo Masters campaign and looks ahead to playing Fabio Fognini next. Watch live tennis streams at http://www.tennistv.com. Rafael Nadal shows he has all the tricks with this incredible forehand winner at the Rolex Monte-Carlo Masters. Photo: Clive Brunskill/Getty Images. Watch live tennis streams at http://www.tennistv.com. Dusan Lajovic comes up with an incredible pass against David Goffin at the Rolex Monte-Carlo Masters. Photo: YANN COATSALIOU/AFP/Getty Images. Watch live tennis streams at http://www.tennistv.com. Catch up on all of the biggest moments from the first three days of the Rolex Monte-Carlo Masters. Photo: Clive Brunskill/Getty Images. Watch live tennis streams at http://www.tennistv.com. ATP Uncovered presented by Peugeot goes behind the scenes at the Fayez Sarofim & Co. U.S. Men's Clay Court Championship, an ATP 250 tournament held in Houston, Texas. ATP Uncovered presented by Peugeot takes a look at Pablo Andujar's amazing comeback from three elbow surgeries and how that low changed his perspective on both tennis and life. Guido Pella had every reason to be pleased with his win over Marin Cilic at the Rolex Monte-Carlo Masters. Watch live tennis streams at http://www.tennistv.com. Felix Auger-Aliassime assesses his next match against third seed Alexander Zverev at the Rolex Monte-Carlo Masters. Watch live tennis streams at http://www.tennistv.com.